I built a small clean room in a closet for my watch repair hobby. In the picture, at the top, you can just see the HEPA filter that blows clean filtered air down on the bench. There is a plastic curtain at the entrance to help keep out dust and dirt. 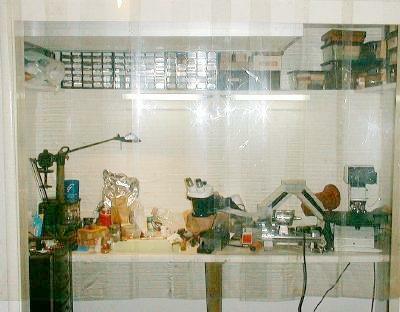 On the shelves are boxes and boxes of watch parts. 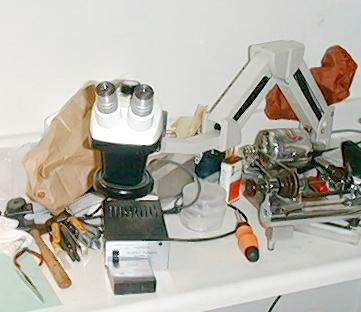 I have two microscopes and a watch lathe on my bench. 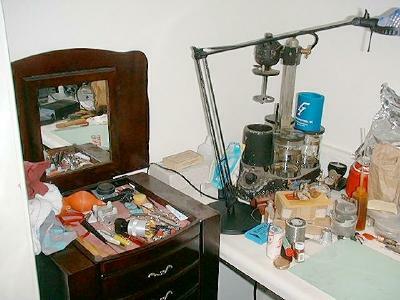 The microscope pictured here magnifies from 50 to 1200 times. The watch lathe is a Levin, that takes standard WW collets. I have made several balance staffs from scratch with this lathe. It also has a tool holding tail stock. Some day I would like to get an cross slide for it. 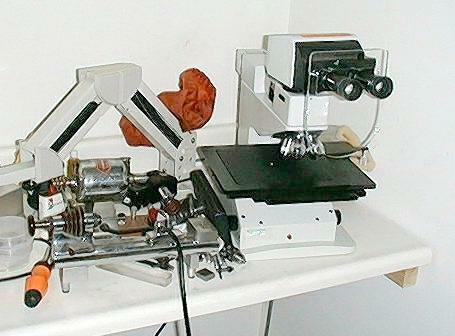 This is my second microscope. It is stereoscopic with magnification from 8 to 40 times. I mounted it on a monitor stand so that it reaches most of the bench. It is especially useful for checking for cracked balance jewels and other very small watch parts. I also use this one when I am making small parts on my lathe. In the corner of the bench is an old L&R watch cleaning machine. I purchased a jewelry armoire and use it as my tool chest. It was about $100 and has a lot of small draws that are useful for watch tools and parts. The lamp pictured is a 50W Halogen that I picked up from Costco for $25. I sit at the bench on an adjustable chair. It raised up about 12" so that I can use the microscopes. When I am working on watches, I lower it so the bench is just a little lower than shoulder height.